Hi, my name is Julisa and I'm addicted to reality tv. 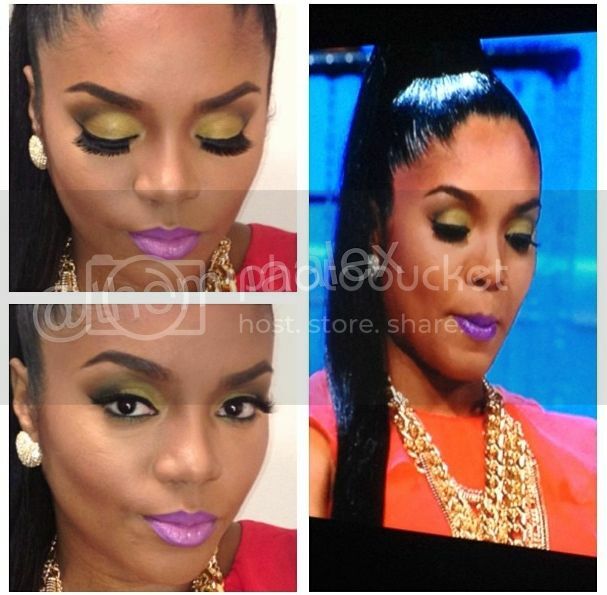 Everyone's makeup at the Love & Hip Hop ATL Reunion was on point so I had the urge to recreate a few of the looks. I started off with Rasheeda's which is still on my face as I type this and I'm loving ittt! NYX lip liner in "Deep Purple"
Maybelline Color Sensational lipstick "Brazen Berry 905"
*Tip* Since this lipstick is somewhat sheer, it looks slightly pinkish due to my lips natural color. I applied a concealer on my lips first to mute out my lip color which helped the lipstick look more purple. L'Oreal Infallible Gel Eyeliner "Blackest Black" Maybelline Colossal mascara in "Glam Black"
If a purple lip is too much for you then of course you can take it down to something softer. I wish I was bold enough to pull off a yellow eye shadow and purple lip. You did an awesome job recreating the look. Can't wait to see the rest! Saw your post on the watermelon tutorial for Spiced Beauty! Just wanted to say I loved it :) I like that it is simple enough that I could do on both hands, yet still interesting and fun!